Stempel Spass: Happy Birthday Vicki! Time to celebrate again - it's Vicki Dutcher's birthday - hurrah! I wish you a very Happy Birthday and many more to come! Vicki is an amazing paper crafter. I am sure you all know her and her wonderful blog All I do is stamp. Go on over and wish her a Happy birthday. Since Vicki is the queen of making beautiful bows and I can't do them I used some seam binding here in her honor. Ich denke du bist im Urlaub!!!???!!! Dann hast du in der letzten Zeit aber heftig vorgearbeitet!!! eine schöne Karte ist das geworden. Ich mag sie sehr. Hope you are having a good time on your vacation! Great use of the challenge colors! I love the polka dot background! 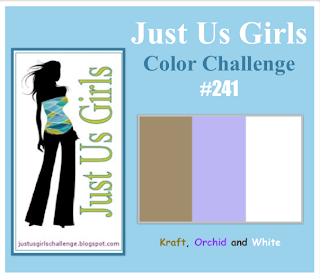 Thanks for joining us at Just Us Girls! Very pretty card! I love the stenciled background and your bow is also very pretty! Thanks for playing with Just Us Girls! Love your repeated "happy" sentiment and the circle of dots in the background! Cornelia...what an amazing card! 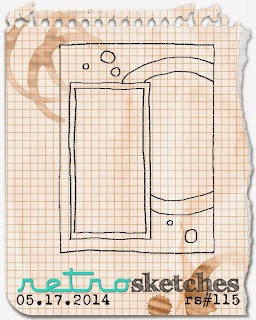 I love those dots, every single one of them and your take on my retrosketch, just so fun! Annabelle May challenge and New Member Welcome! Guest Designer at the Muse! Paper Smooches - and more cards to showcase! Dream Valley Challenge #81 "Anything Goes"